??? Orange Transparent / Black Speckled Judas Priest official page exclusive. ??? Orange Transparent / Black Speckled + CD Judas Priest official page exclusive. ??? Orange / Black Marble released in Japan. ??? Burgundy released in Australia. ??? Red + Obi, released in Japan. 500 Red & Yellow with Black Marble signed, PledgeMusic exclusive. 500 Black with Clear Swirl signed, PledgeMusic exclusive. 500 Clear Nuclear Blast exclusive. 500 Orange Century Media exclusive. 750 Yellow transparent EMP exclusive. ???? Black Released in EU. ???? Black Released in USA & Canada. ???? Black Released in Japan. Side A pressed a little off center which affects the sound negatively a little, but not as bad as other albums suffering this issue. 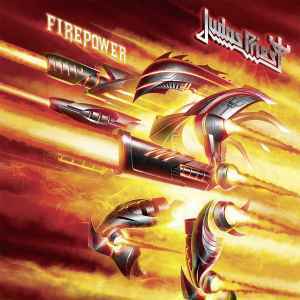 Very few albums have ever impressed me as much as Firepower. Rarely do I get hooked at the first listen and very rarely do I like every track, without multiple plays. I've always loved Priest' ever since I first saw them on Top of the Pops back in 1978. 40 years later I thought there day was truly done. How wrong could I be? This album is the best they've produced. It tops the brilliant Killer Machine and Stained Class, which I've held above all others until now. Flawless. Superb lyrics, vocals, riffs, solo's, bass, drums, tempo, rhythm. A nonpareil of metal albums. Remind me again how old they are? Absolute killer album, from start to finish! No complaints, the vinyl press sounds great! anyone compared the matrix of this to EU red ? Someone knows if this version have the embossed cover?? Thanks. This album is a return to the Priest of old's excellent riffs and lyrics a all around solid metal album from the legends. Just a little sad about Glenn Tipton not being able to tour the album. The obi strip. But is that really worth 10 times as much? Even if it's limited to 50 copies, it seems to me that this one is way overpriced. Great sound on this pressing. However, I prefer the black US pressing over this one. Clarity is just a bit better on the black version. But this isn't bad at all and the orange and black spackle effect is nice to look at.